​303 Gallery is proud to present our fourth exhibition of new works by Ceal Floyer. Floyer's phenomenological readymades, often subject to bewilderingly simple semiotic inversions that have the power to re-route perception, have made her a key figure in post-conceptualism from the late '90s to the present. For this exhibition, Floyer presents new works in video, photography, and sculpture. 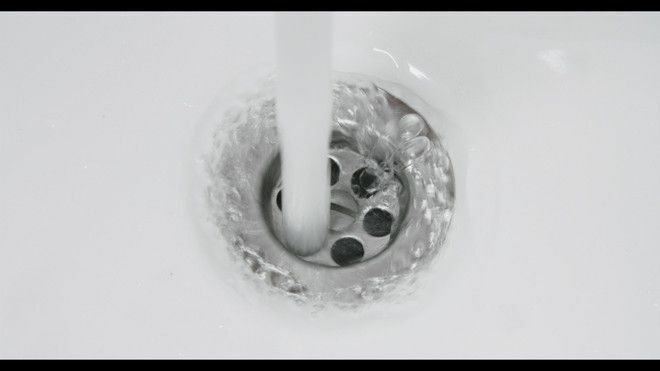 In "Plughole" (2017), a static camera is trained on a standard 6-hole bathroom sink drain. The video depicts a stream of water that is redirected in an attempt to fill each hole perfectly with the flow of the faucet, moving from one hole to the next. The drain's function as a receptacle for water becomes a kind of short-circuit, as water itself becomes the material that plugs its own pathway. This transference of states is a recurring motif in some of Floyer's most effective work with manmade interventions into natural experience, as seen in her now seminal "Light" (1994) or "Overhead Projection" (2006). Simple phenomena are exploited for their most basic physical malleability, and coaxed to create counterintuitive or impossible paradoxes laid bare and envisioned in real time. "Saw" (2015), on view at 303, transforms the gallery into a cartoon nightmare, as a saw almost completely charts its circular path along the concrete floor. The saw could essentially be tracing a portal under the conception of Floyer's practice - formal elegance, astute wit, and perceptual disorientation combine to create a new type of distorted metaphysics. Also on view extending the length of the gallery is "Domino Effect", a narrow row of black wooden blocks lined up to form a kind of miniature wall in the space. Set in a tight row, the domino effect (of these pieces falling onto each other in a beautifully cascading mathematical arrangement) becomes not only a physical impossibility but a symbolic one as well, as these small wooden pieces in a way cease to be dominoes at all according to their current configuration. An object's elucidatory intention gone haywire is seen again in "Newton's Cradle," a typical balance ball / pendulum set that you would find in an elementary science class, or as a stress relieving ‘toy’ classically found on an executive’s desk. The gambit in this case is that all the balls are tangled into a post-stress knot. Again Floyer subverts the object's ability to explicate itself, instead fashioning it into a kind of allegorical straitjacket that is nonetheless elegant in its own new permutation. "Conversation Piece" bookends the exhibition, a set of quotation marks bracketing the gallery space at the entrance and exit, not only poking fun at the mounting of an exhibition, but the rhetoric around it - including the reading of this text.